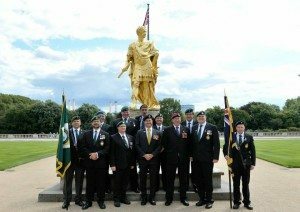 The South African Legion – United Kingdom branch, held a medal parade for fellow Legionnaire David Mannall MMM on the 23/08/2014 as well as supporting him in the launch his new book ‘Battle on the Lomba” at the Oriental Club. Dave received his long awaited and very well deserved Military Medal of Merit (MMM), his Pro Partia, his Southern Africa Medal and his General Service Medal from the SA Legion on 23/08/2014 whilst parading on what is one of London’s most prestigious parade grounds at the Royal Hospital – Chelsea. We were also joined by Sgt. Johnson Beharry VC (the first living recipient of a British Victoria Cross in 30 years) who added to the prestigiousness of the occasion. Naturally as South Africans a good social was well in order afterwards and a couple of beers went downrange after a thirsty parade with the Chelsea Pensioners. Our deepest thanks to the SANDF ceremonial office who saw Dave’s rightful medals finally awarded to him, and our thanks to John Rochester the RQMS of the Royal Hospital for the lunch, venue and hospitality. Thanks also to Sgt. 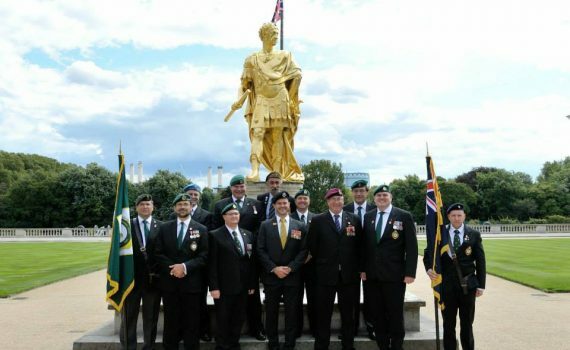 Johnson Beharry – a privilege indeed.